Quiet and beautiful city Matsue in Shimane Prefecture. | Why don't you go on a trip to Japan? 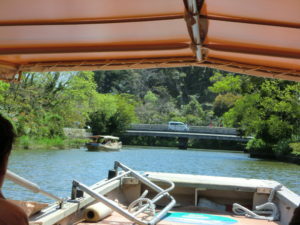 The fifth day of the trip is Matsue sightseeing. 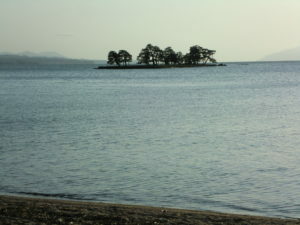 Matsue is the prefectural capital of Shimane prefecture. But it is a quiet and beautiful city. In Japan, the depopulation of rural areas has recently progressed, and the declining population has become a problem. Matsue is the biggest city in Shimane prefecture, but I realized here even at the capital city Matsue, the department stores and restaurants close earlier at night, there are only a few variety shops there. and the train runs just few per hour. Matsue was a castle down town developed around Matsue Castle. 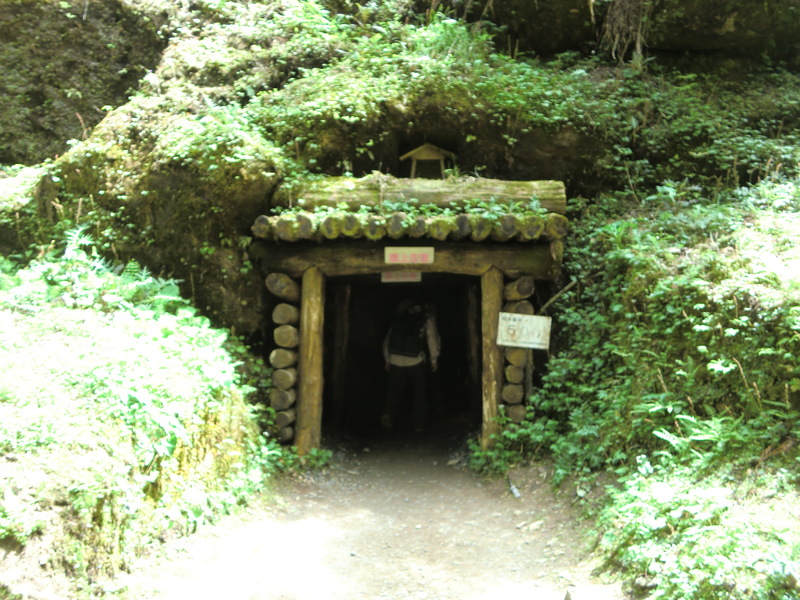 It is maintained as a tourist attraction area. I bought a 1 day ticket for sightseeing in front of Matsue station. If you use this ticket, you can go to most sightseeing spots in Matsue city. First of all I went to Matsue Castle. 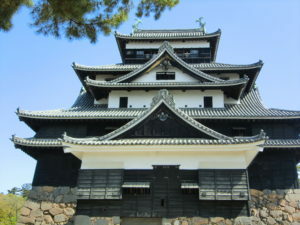 The Castle was built in 1600 by Yoshiharu Horio Matsue lord. 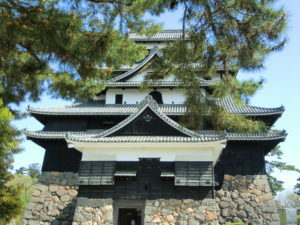 The donjon of this castle is designated as a national treasure, and it has characteristics in that roof. You can see stone walls and remains in the park. Hori river flows in the city surrounding this castle. 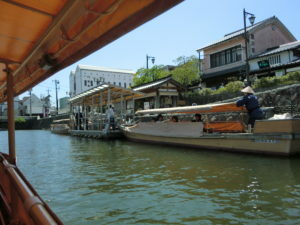 I took a sightseeing boat and see the town from the boat. It can get on and off at several points of the river. And then I visited Shiominawate area in down town of the castle. I walked around on a street with a samurai residence. 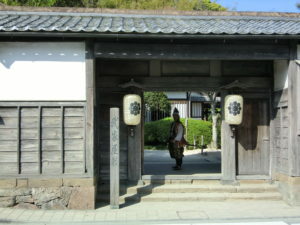 Some old samurai residences still remain and some of them can be entered. 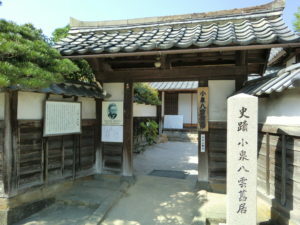 One of the samurai residences was the house where Koizumi Yakumo lived, and I got into the house. He is Lafcadio Hearn, 1850-1904, although he was a journalist of English nationality, he was interested in Japanese literature and came to Japan. And he became an English teacher in Matsue city. He also worked as a writer. He married a Japanese woman, Setsu Koizumi, and became naturalized to Japan. And then I went to Shimane Prefectural Art Museum. This museum is located on the lake side of Lake Shinji, exhibits paintings of Courbet, sculptures including Rodin, and other works of writers who are visiting Shimane prefecture. From the cafe in this museum, the shinji lake looks very beautiful. It was time to sunset, so I went to the lake and saw the sunset. 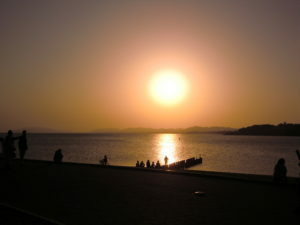 In Matsue city, I could visit for one day to sightsee where I wanted to go. It’s not that big city. I found a massage shop in front of the Matsue station, I took treatment and massage with my foots and was very relaxed because I had walked that day too much. I returned to the hotel and picked up my luggage. After having dinner, I went back to my home town by a highway night bus to Yokohama.